Are you looking for more ways to succeed with Forex Fury? 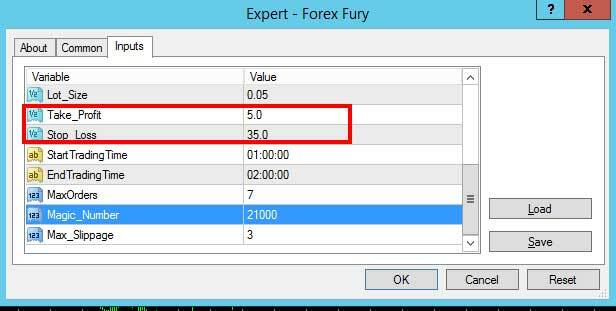 Do you want Fury to better match your trading style? Or do you just want to test some different pairs? Today I will be showing you a great way to get more out of your Forex Fury experience by modifying settings, adding pairs, and utilizing the full compliment of your unlimited demo accounts. Over the years, Fury has become more and more capable of trading different pairs. Generally we prefer 1 pair per account. This lets the robot utilize all its resources on the 1 pair. But how do you choose which pair suits your needs best? Well, the best way to do this, is to install multiple MT4 platforms, and run a bunch of demo accounts. The unlimited demo accounts really makes your life easy, and gives you the opportunity to modify and test more than any other system on the market. Here you can see all of the platforms that I’m currently running, in testing different Fury setups. To add a pair, just open the chart from your market watch, and then drop Forex Fury on it, just like is shown in the members area video. Historically, our goal is to trade 4-5PM EST, which is 9-10PM GMT. Yet, in recent times, some of our clients have started testing outside of this period. Many of our clients are having great success in doing so, but the early reports show that it is still ideal to trade 1 hour per day. The most success is coming from traders experimenting in the Asian session. Here are some of the most popular hours our clients have been reporting. These are three options reported by our clients that are showing increased potential in 2019. So how do you change these times so the EA trades during these periods? First, you need to find out your broker GMT offset (your location doesn’t matter). Once your broker gives your GMT offset, you can modify your time settings accordingly. 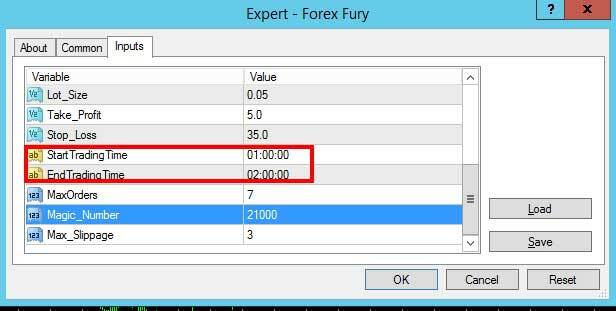 Let’s say you want to change your time settings to trade tokyo open which is 1-2AM GMT, this is how you would calculate your Start Trading Time and End Trading Time settings. The calculations are really quite simple, and once you have them, you just need to right click on your chart, and go to expert advisor properties, to access the time settings. Once in the properties, you can see your start trade time and end trade time. You just double click on these, and then modify it to the time you want the EA to trade. As always, we recommend 1 hour per day to stay within our low risk profile. Now you know exactly how you can trade a different time, and a different pair. Many clients also make minor setting modifications. Considering this is a scalping approach you generally want the SL to be higher than the TP. These are the main settings that our clients like to modify. Accessing these are the same way you access the time settings. 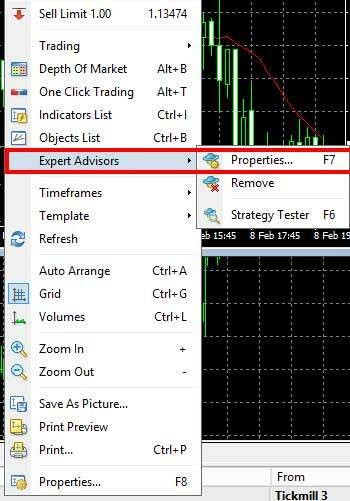 You right click on the chart and go to expert advisor properties. Many or these take profit and stop loss levels have reported large success rates. Again, this is a scalper so the risk reward ratio is always going to be skewed. You can test this system with 1:1 risk reward ratios if you like, but that’s not generally how scalping systems perform. There are SO MANY ways to be successful with Forex Fury. For some, the default approach just doesn’t cut it, and so they make these modifications. You can change the settings, change the pair, and even change the time the robot trades. Run 20-30 accounts like this for a month, pick the best 1 or 2, take them to your live accounts and thrive. This is a great way to earn more with Fury!